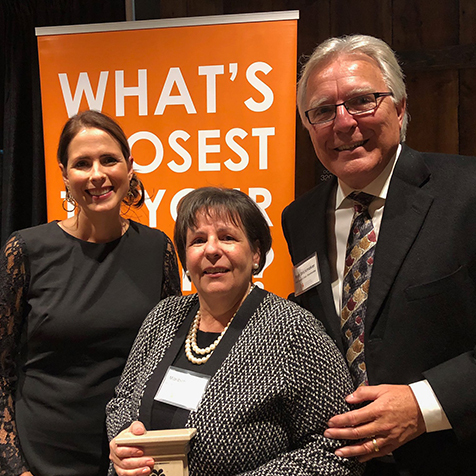 The Foundation for Appalachian Ohio’s President & CEO, Cara Dingus Brook (left), and Board Chair, Ronald Strickmaker (right), present Maribeth Wright (center) with the Chaddock Philanthropist of the Year Award. Cambridge, Ohio – Rea & Associates, a regional accounting and business consulting firm, announces that Maribeth Wright, CPA, principal in Rea’s Cambridge office, was recognized as the inaugural winner of the Foundation of Appalachian Ohio’s Chaddock Award for Philanthropist of the Year. The Foundation of Appalachian Ohio (FAO) observed its 20th anniversary with friends, donors and grantees who have helped create opportunities in and for Appalachian Ohio’s communities over the last 20 years. The FAO awarded the Chaddock Philanthropist of the Year Award to Maribeth Wright, a Guernsey County resident that serves as a dedicated philanthropist in her community. Wright is the president of the Guernsey County Foundation Fund, the first of ten community funds established with FAO to build local philanthropy. Wrights’s gifts of time and talent have helped the Guernsey County Foundation Fund grow over the past 14 years to include 45 funds that have generated $9,578,879 in assets dedicated to the opportunities, needs and future of Guernsey County and its people. The Chaddock Award for Philanthropist of the Year is named after Jeff Chaddock and is an award designed to be given annually to celebrate the role of philanthropy in the prosperity of the region. The Chaddock Award will continue to recognize the significance of Chaddock’s gifts to the FAO and the region. Wright earned her bachelor’s degree in accounting from the University of Mount Union. She has more than 30 years of experience in the accounting industry and currently resides in Cambridge.